Sometimes I get this creative urge that drives me to just make something, then photography is a nice outlet, I get to conceptualise and plan something, set up and experiment with image technology, act as a talent and finally dabble around with editing. This entry is about a project that stretched between 2013 and 2016, it turned into a series which I now see as complete. I’ll tell you the story. 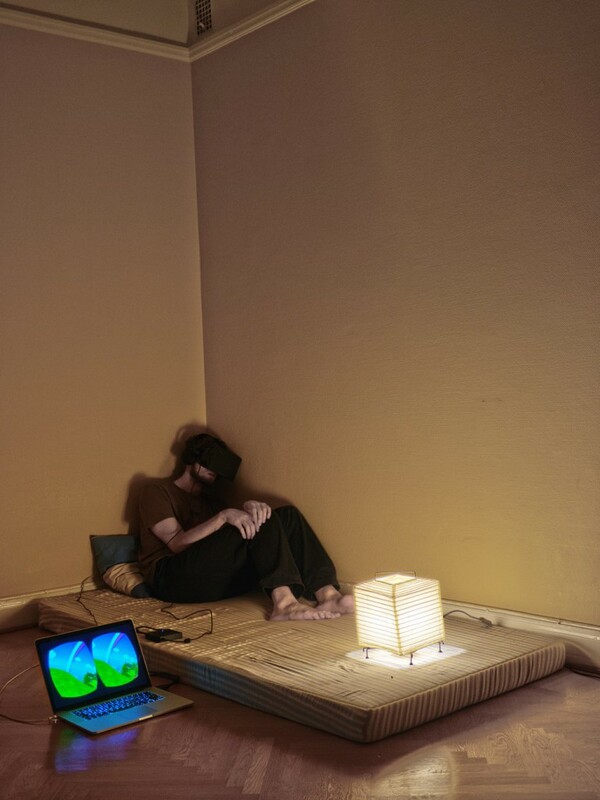 Back in 2013, the year I got the Oculus Rift DK1 virtual reality headset, I got the idea to somewhat reenact a very known cyberpunk art piece using the kit, the end result is what you see below. At the time I had just moved in with a few friends the previous month. In the shot I used the bottom mattress I had to sleep on, placed my work Macbook Pro next to it and emptied the rest of the visible floor, which at the time was done very quickly as my room was almost entirely void of possessions. The experience seen on the screen was an actual live application and indeed what I saw in the headset. I moved around in the game world until I found a vantage point I thought looked like what you can see on the goggles in the reference art. To capture this self portrait I used my phone and TriggerTrap to continuously take in-camera bracketed shots, reposing myself between every three exposures and trying to imagine what could look remotely similar to the artwork. 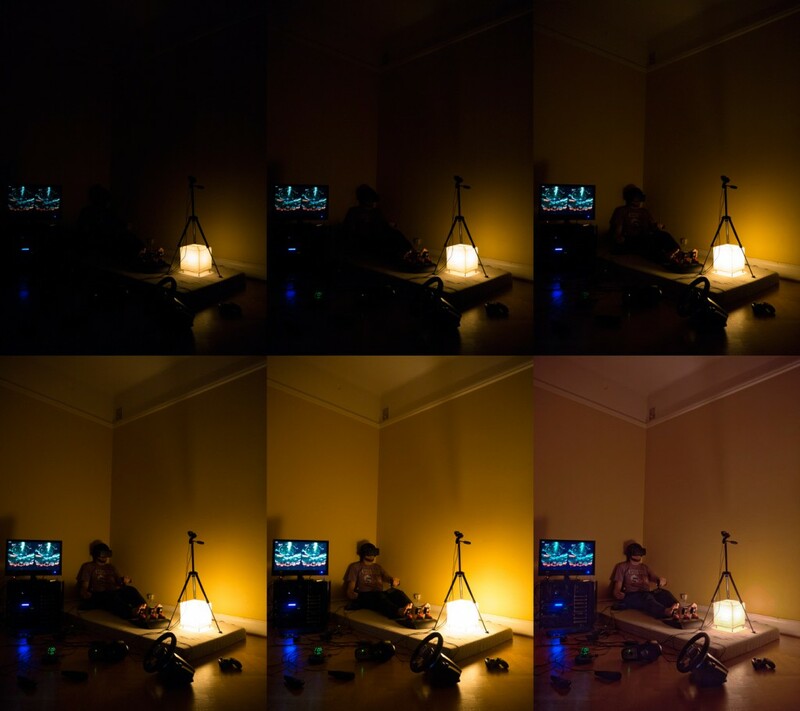 I did bracketing because I wanted details in the lit lamp, the screen as well as the very dark shadows. I did about 4-5 passes, posing, checking the camera for results, posing again until I figured I had something to work with. As I currently don’t have access to my large Lightroom Catalog because the app refuses to work with network drives I have no way to check what kind of editing I did, now 2.5 years later it is quite fuzzy in my mind but I’ll post a small strip below of the three source exposures and the final edit. Basically it’s a simple HDR merge and no other editing outside of basic adjustments and some selective desaturation. 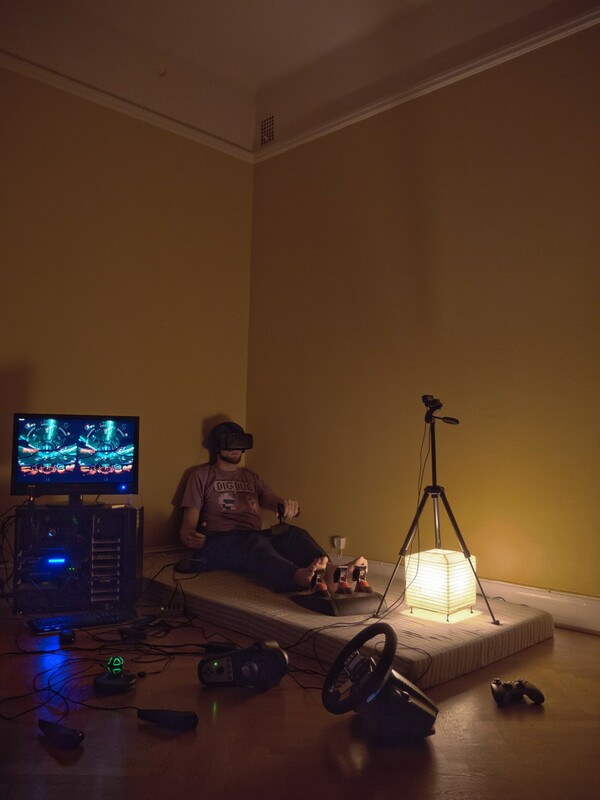 The image itself was made solely to be posted on the Oculus subreddit over at Reddit, an open forum and community about virtual reality and the company behind the headset I was wearing. Just as I mentioned in the previous entry it’s easier to find motivation to be creative if you have an audience you are fairly certain will appreciate what you make. After posting it, it randomly got a lot of attention over at Imgur, the image host I used. Somehow that score seemed to have transferred to the Reddit post itself, it ended up being the top voted post for the entire subreddit for quite some time to probably everyone’s surprise. In 2014 I got the Oculus Rift DK2, the next generation development kit, and after a couple of months using it I decided to do a follow-up image to the first one. This time around I had no real idea or concept behind it, so I just went full bonkers and used all accessories I had amassed for VR up till then. You can see the final result below. One motivation behind making this picture was that I less than two weeks earlier had acquired a GTX 970, this is the the card you see shining blue inside my old desktop, a computer that was brought out of storage for me to have something to play games on. The Macbook was not really built for gaming or VR. The accessories in the picture that I had bought solely for VR are as follows: Razer Hydra, Logitech G27 wheel, Thrustmaster T-flight HOTAS and the Leap Motion (on top of the PC tower) hand tracker. The Xbox gamepad is in there as well because it was used in quite a few of the VR titles I played and I preferred it above keyboard and mouse when in VR. 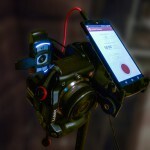 Fitting enough the consumer Rift would end up shipping with just that, a gamepad. This time around I figured I wanted more stops of light between the darkest and brightest pictures so I went for five exposures per bracket, this as each step in the bracket can at the most be one stop from the previous one. This is a limitation of the camera I own, the Panasonic Lumix G5. If my memory serves me I had ghosting issues when merging the five shots so I ended up not using all of them, which was fine as long as the entire range of light to shadow is still covered. As reference I’m providing a similar strip of images as before, or a grid I guess, so you can see what I had to work with. The sixth image is the final edit. It didn’t help with editing that my brightest image still was quite dark, so increasing brightness introduced crazy amounts of noise in the image, this left the final result quite dark. What I really struggled with was getting a look I thought would fit the scene, I was uncertain if I should keep the sad mood of the first picture or make this happier, mostly from color balance and saturation, this confusion came from me not really having a set theme this time around so it became a little bit of everything. In my opinion this is definitely the weakest picture in the series, I even had a hard time coming up with a sensible title for it. A fun tidbit about this photograph is that the game on the screen is just a static screenshot. I wanted something flashy and I didn’t have access to an early build of Elite Dangerous, it was to be released first two months later. It is still what I was looking at in the headset though as I was running with a single monitor back then, I tried to angle my head so it would match what I saw. This was also posted exclusively to Reddit. 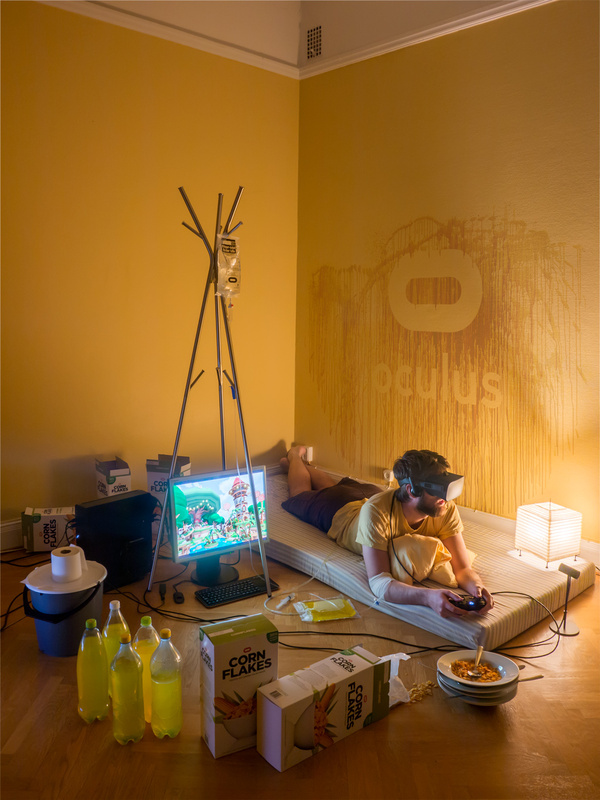 In 2016 my mind was fired up for the actual Oculus Rift release, the CV1, the consumer product. My original idea was to have me standing in a victory pose of sorts, that things went from dystopian to utopian from the first to last picture in the series. This fell short though as the Rift did not ship with Touch, Oculus own tracked hand controllers, because of that my mind went in the opposite direction and it became perhaps an even more dystopian picture than the first one. See the result below. A lot of things are going on here. The base concept is actually an old idea I had before I wanted to do the utopia one, but where I would be in an ambulance or an actual hospital bed while in VR, kind of what would take place after this picture. I am lucky to know a few people in the medical business so I was able to get my hands on an IV bag and a catheter without too much trouble, prop ideas that came from a nurse I know when I mentioned the project. Add to this some bottled coloured water, a bucket with a toilet paper roll on it, a bunch of cornflake boxes and it’s a picture. I was told by the nurse it was the proper color for matching the urine from someone who has been on IV for some time, otherwise that color was the biggest uncertainty with this shot for me. The hardware used in the picture is my recently built Mini-ITX machine, an old 4:3 monitor and the Rift CV1. Yet again the monitor is displaying a static screenshot of a game, Lucky’s Tale, this because the actual game is only displaying a very small window on the screen during normal gameplay which would have looked quite lame. Lumix G5 and webcam mounted on a rail and tilted. 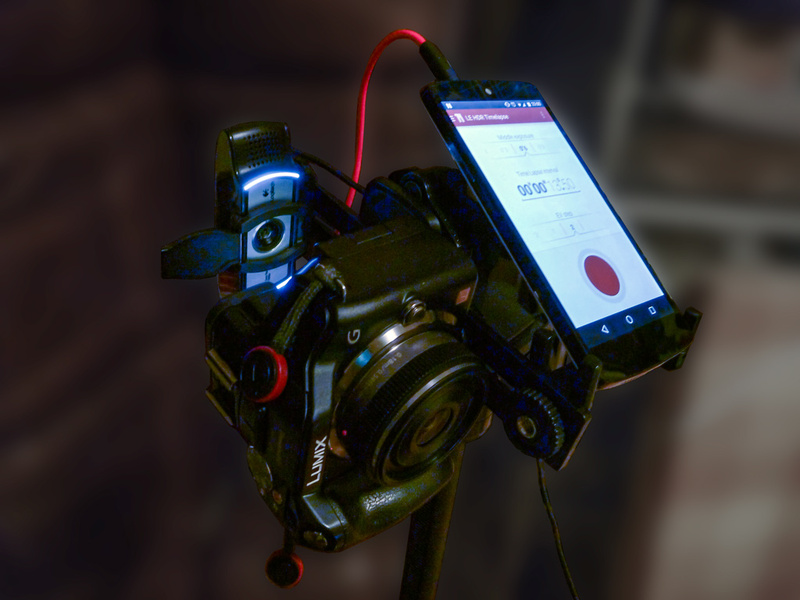 Smartphone reverse mounted running TriggerTrap for bracketed bulb time-lapse. 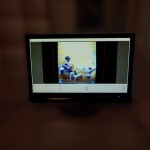 This is the monitor I saw in Virtual Desktop, I used OBS to quickly rotate and crop the webcam image. In the headset itself I was looking at the secondary monitor, which I also used for tome side light from the left. 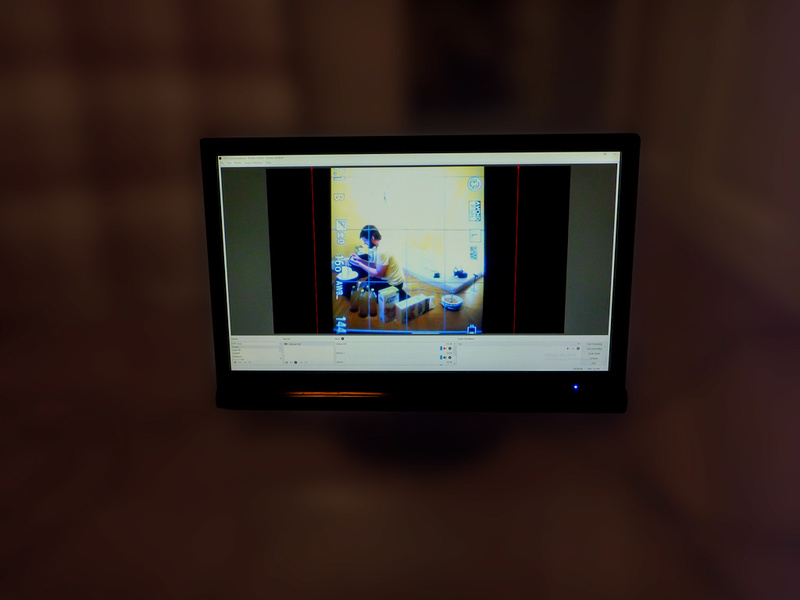 I was using an app called Virtual Desktop which shows me my desktop in VR and was through OBS displaying my webcam which was aimed at the camera LCD. This way I could actually see how I was posing while wearing a VR headset, similar to what I did for a Christmas card in 2014, even if the camera has no live output. I also used this to reposition some of the props, it was a bit tricky though due to how much the image had degraded before I saw it in the headset. The images above show the technical setup, it was taken with a crappy camera though as my best gear was part of the actual rig. Below is a short time-lapse of the setup and shooting process, I messed up in the middle with the classic mistake of turning off the recording when I thought I turned it on and vice versa, but it is fairly complete nonetheless. Yet again I used TriggerTrap to do my chained bracketing. On a whim I tried a different mode and used Long Exposure HDR time-lapse. Basically I put the camera in bulb mode so it would expose for as long as the shutter release was held, then by using the TriggerTrap dongle and this LE HDR mode I could get way more stops of light between my bracketed shots, which I think is pretty evident in the final picture. It did bring with it a few issues though. When I the day after shooting merged my selected three shots in Lightroom I would get strange halo effects around the brightest spots of the resulting HDR image which made me wonder if I had messed things up, the source images looked fine though. What I could do was use de-ghosting, it effectively removed the halos but also introduced a whole lot of noise in the darker parts of the image, which means most of it. What I ended up doing was to layer one HDR image on top of the other and mask out the halo effect and bring in the brightest parts from the de-ghosted image. 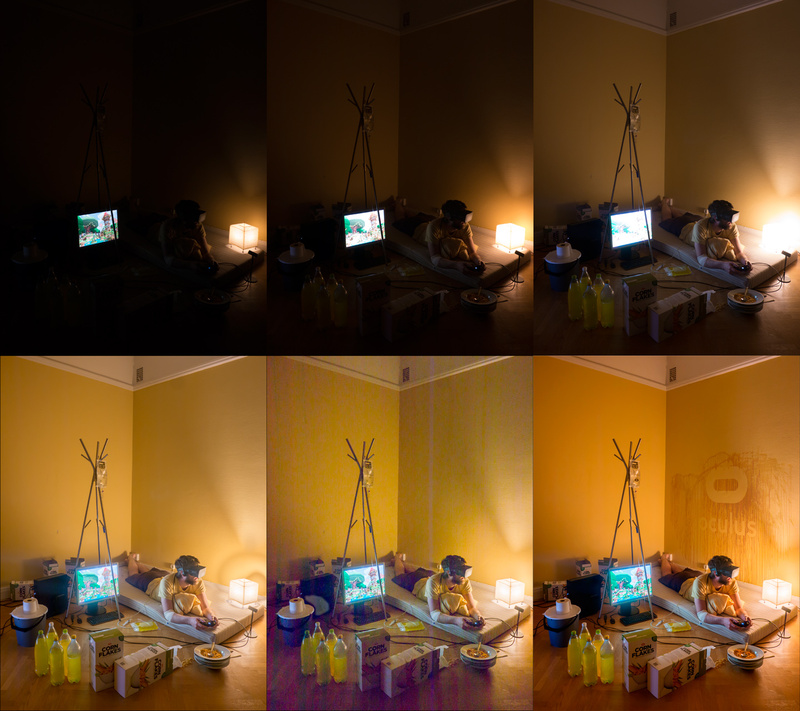 This worked out very well, see below for the source images, the two HDR merges and the final result in a single grid. As you might have noticed in the final version I also added a painting on the wall, this was a texture downloaded from Textures.com which I then applied some selective masking to. I also replaced all the ICA logos on the cornflake boxes with the Oculus logo as well as adding it to the IV bag. And hardly worth mentioning, I digitally opened the IV tube and valve in case anyone would study this in detail, they were closed as I did not actually have a needle in my arm. After that there was the standard adjustments like color balance, levels and fixing a few blemishes before I posted this as well to Reddit. The last detail that is fun to mention is that I had gone without shaving for almost a month and grown out my beard and hair since winter because I wanted a specific look for this specific photograph. The day after the shoot I trimmed it all down to get back to looking somewhat respectable! This entry was posted in Photography, Projects, Virtual Reality and tagged Oculus Rift, Panasonic Lumix G5, Photos, Photoshop, Video, Virtual Reality. Bookmark the permalink. Thanks :) We’ll see how long it will take before we hear VR horror stories, about people forgetting to eat and drink or take care of their kids/pets. It’s bound to happen if/when the medium catches on with the general public. It kind of reminds me of when World of Warcraft got popular, it sucked in a lot of people, myself included. Scary stuff!